I know with most of the world’s work schedule baking is the last thing on your mind. Especially on a week night. 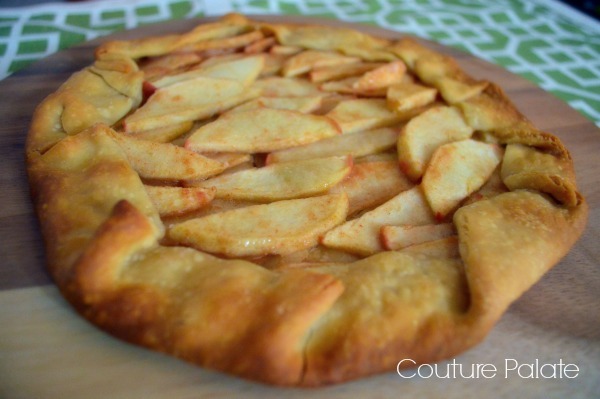 Sometimes during the week I want a quick, easy dessert to whip up and enjoy after working all day.This rustic apple galette does just the trick. Light, minimal ingredients and 20 minutes later, Voila! Mix sugar, flour and cinnamon in a bowl. Add in the sliced apples and cover with the mixture. 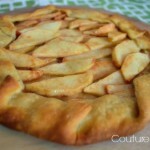 Top the apples over the middle of the crust leaving a little room on the outer edges. Fold up the edges to seal around the filling. Ashley is a freelance writer, editor and recipe developer. She is a passionate foodie and loves sharing her affinity for cuisine through her writing. She vows that nothing brings people together like a wonderful meal and great conversation. She enjoys cooking, fine dining, photography and traveling. She is also a co-host on Designed by Magic a podcast on 407 the PARX. ©Couture Palate, 2008-2015. Unauthorized use and/or duplication of this material without express and written permission from this blog’s author and/or owner is strictly prohibited. Excerpts and Links may be used, provided that full and clear credit is given to Couture Palate with appropriate and specific direction to the original content.You may pin photos to Pinterest as long as they link back to the original post. Photos may not otherwise be reproduced, copied or used without expressed written consent of Ashley, owner of Couture Palate. All recipes on this website are original recipes unless otherwise stated.